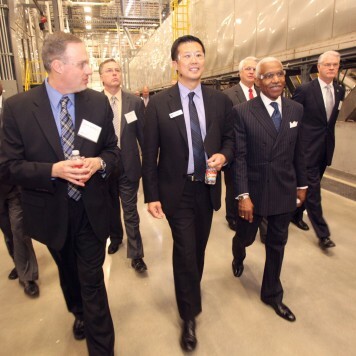 MEMPHIS, Tenn., January 15, 2013 – Jack Truong, president and CEO of Electrolux Major Appliances North America, joined other Electrolux senior management today to provide a preview of the inner workings of the new 750,000-square-foot Electrolux manufacturing plant to local and state leaders and the news media. Shelby County Mayor Mark Luttrell, Memphis Mayor AC Wharton, State Senator Mark Norris and Tennessee Lieutenant Governor Ron Ramsey were among the group who participated in the first tour of the facility. Electrolux highlighted different pieces of high-tech digital equipment, including specialized robotics and automated assembly lines. This technology and manufacturing process is part of Electrolux’s commitment to innovation and will be key to the production of Electrolux®, Electrolux ICON® and Frigidaire® built-in and specialty cooking products, including drop-in/slide-in ranges, wall ovens and specialty freestanding ranges. 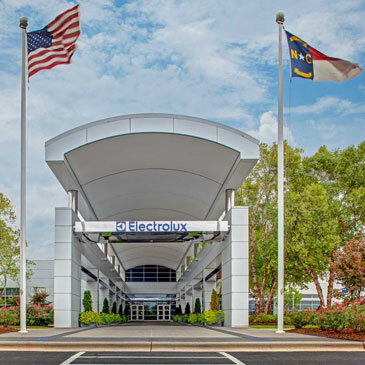 Electrolux executives also showcased the plant’s research and development center, which was designed to simulate a product’s lifetime usage and performance expectations and can test up to 380 products at one time. The group also got a look at the latest construction progress, and saw four of the first stoves that will be produced on the manufacturing line. The Memphis plant has already hired 90 employees and will hire approximately 160 more between now and May 2013. Positions are currently being offered in engineering, supply chain management, finance and operations management. The plant will eventually employ 1,200 people over the course of the next five years as it reaches full production. An estimated 3,600 more jobs will also be created by suppliers who will support the plant. 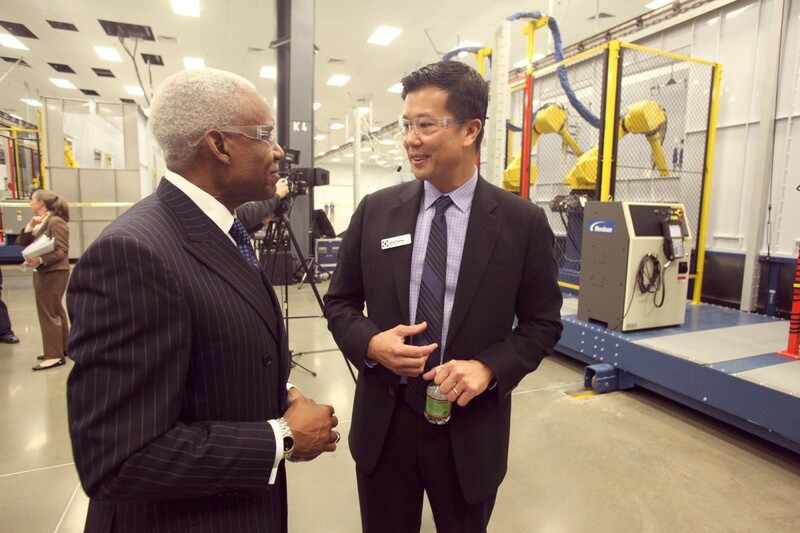 This is the second Electrolux facility in Tennessee – the company also has operations in Springfield, bringing total state employment to approximately 4,000. Electrolux is the largest manufacturer of cooking products sold in the U.S. and Canada. Electrolux is a global leader in household appliances and appliances for professional use, selling more than 40 million products to customers in more than 150 markets every year. The company focuses on innovative solutions that are thoughtfully designed, based on extensive consumer insight, to meet the real needs of consumers and professionals. Electrolux products include refrigerators, dishwashers, washing machines, cookers, air-conditioners and small appliances such as vacuum cleaners sold under esteemed brands like Electrolux, AEG, Eureka and Frigidaire. In 2011 Electrolux had sales of SEK 102 billion and 58,000 employees. For more information, go to www.electrolux.com/press and www.electrolux.com/news. 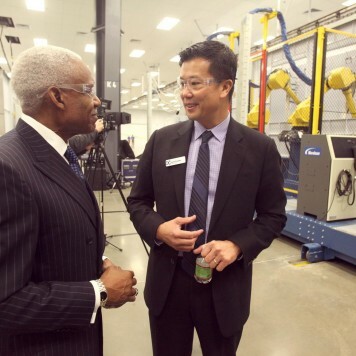 Jack Truong, president and CEO of Electrolux Major Appliances North America, leads a tour of the new Memphis manufacturing plant. 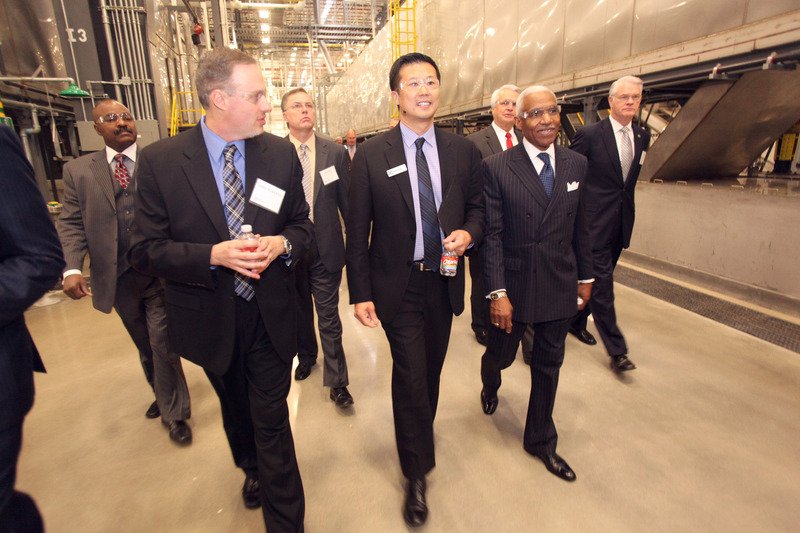 From left to right: Adam Roberts, ElectroLux project director; Mark Herbiso, Greater Memphis Chamber senior vice president of economic development; Electrolux CEO Jack Truong, City of Memphis Mayor A.C. Wharton; Tennessee Lieutenant Govenor Ron Ramsey and Shelby County Mayor Mark Luttrell.